Among the first canned beers to come out of Collingwood’s The Craft & Co is the brewery’s take on hazy IPAs. Head brewer Heath McVeigh says the brewery went for Vermont IPA to keep the beer distinct from the cloudiest examples of the style and focus instead on the hops and how they were added to the boil. Featured hops are El Dorado, Citra, Falconers Flight and Idaho 7, which together produce a medley of flavours from tropical fruit, citrus and pine, with a light hint of honey. 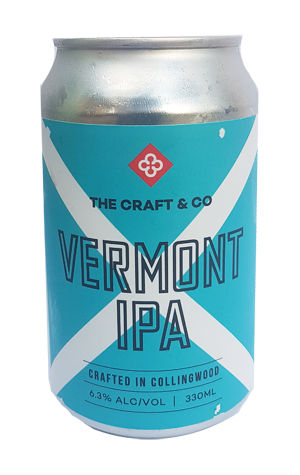 Compared to many other beers in the style, Vermont IPA has a more assertive bitterness than drinkers might be used to, while the inclusion of flaked oats in the malt profile lends the beer a soft and slightly silky mouthfeel. Free Keg Friday - brewers tap one free keg for punters at 5pm every Friday.